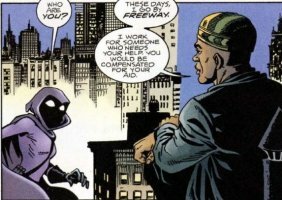 Freeway is an expert on anything to do with cars, and very handy with deception as well. He works for the mysterious Athena, who sent him to intercept Spoiler. Freeway gave Spoiler his card, which led her to get involved a complex case with an accountant from the Ruvaclava mob. Unbeknownst to Steph, a side benefit of her work was that she was taking out the competition for Athena.